The Government had earned Rs 6.7 million from the 25,000 vehicles that had travelled along the Southern Highway to date, Deputy Minister of Ports and Highways Nirmala Kotelawala informed Parliament yesterday. The Deputy Minister, who was speaking during the debate on the committee stage of the Budget in Parliament, said that both private busses and those belonging to the CTB would be allowed to travel on this highway shortly. 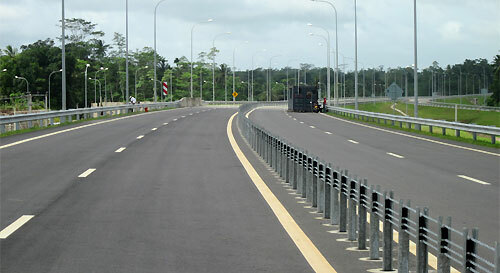 He said that the construction of the Colombo Katunayake Highway, which was proceeding at pace at the moment, would be completed in 2013. Responding to charges by opposition members with regards to the Dehiwala flyway, he said it was built to ease the traffic congestion in the area and not to send each and every vehicle along it. Parliamentarian Namal Rajapakse told Parliament today that a railway track will be constructed from Beliatta to Kataragama. He further said the railway line will be extended from Kataragama to Arugam Bay. A highway will also be constructed parallel to the railway lines, the MP revealed.